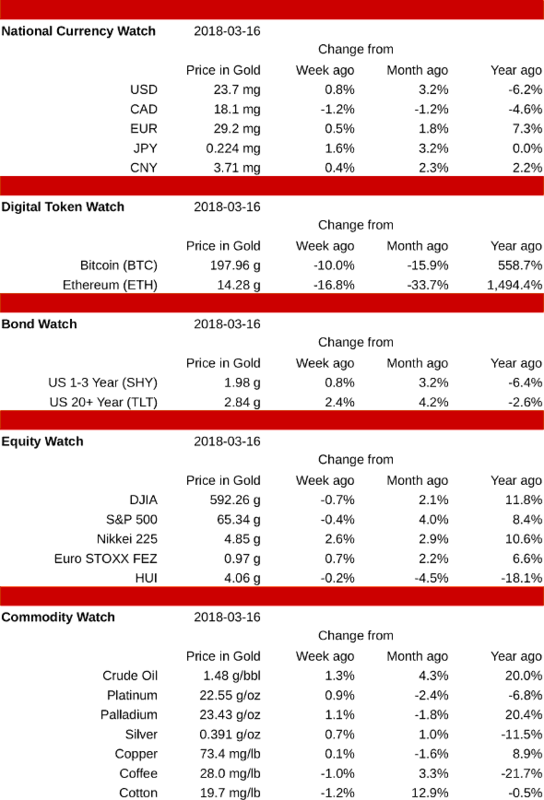 This was a rough week for cryptocurrencies, a good week for bonds, and a mixed week for other asset classes. Ethereum took the biggest beating, falling 16.8% to close at 14.3 grams. Bitcoin also fell hard, giving up 10.0%. Strongest was the Nikkei index, which rose 2.6%, closely followed by 20+ year treasury bonds, which gained 2.4%. The Canadian Dollar was the only falling currency, dropping 1.2%. The Japanese Yen rose the most, gaining 1.6%. Short term bonds and USD cash each added 0.8% while the long term TLT rose 2.4%. Stocks were strongest outside the US, with the Japanese Nikkei rising 2.6%, while the Dow Jones Industrials fell 0.7%. Gold stocks fell 0.2%, approaching their long-term support level of 4 grams. Energy and metals were higher this week, led by crude oil, up 1.3%, and palladium, up 1.1%. Cotton fell 1.2% while coffee dropped 1.0%. Silver rose 0.7% and copper was little changed, up 0.1%. More on the Crypto Crash below. In spite of the recent drop in Bitcoin (and other cryptocurrency) prices, Bitcoin remains in a strong uptrend. Three months ago, Bitcoin was trading at an all-time high of 483 grams. By the beginning of March, its price stood at 260 grams, down 46%. This week it closed at 198 grams, off 59% from the peak. There is no shortage of explanations for the drop, including various government announcements ranging from new regulations to outright bans, massive sales by various actors including the Mt. Gox bankruptcy administrator, and negative pronouncements by leading investors including Warren Buffet and Jamie Dimon. But in spite of all this hoopla, it is useful to stand back and look at the bigger picture. Although down 16% in the last month, Bitcoin is still up 559% over the last year! And take a close look at the chart below, which is updated weekly on the Bitcoin page. This is a log chart. That means that a rising straight line on this chart represents compound growth. I've drawn two uptrend lines, one starting in mid-2015, showing that Bitcoin's price has been more than doubling every 9 months since then. The second line shows that the price has been more than doubling every 4 months since early 2017. And neither of these powerful uptrends has been violated by Bitcoin's recent volatility. Of course, these trends will not continue indefinitely. Eventually, they will slow or even reverse. When everyone has the coins they need and want, prices will stabilize at some point. But I think we are still very early in the crypto game. As adoption spreads from the current tens of millions of users to billions of users through networked sharing, this pattern of exponential value growth could continue for quite some time. 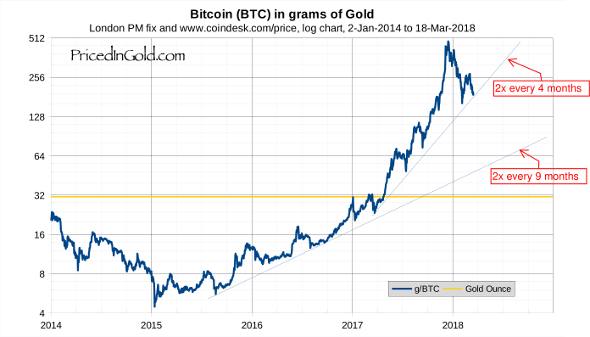 If the 4 month doubling trend continues, we can forecast 1 BTC buying 1 kg of gold in early 2019. On the other hand, Bitcoin could rapidly fall from the current 200 gram level to about 50 grams without violating the 9 month doubling trend. At that rate, we could see 1 BTC buying 1 kg of gold before mid-2021. I don't see Bitcoin, or any cryptocurrency, replacing gold – though they may provide new ways to move gold value around the world quickly and easily. But as a counterparty-risk-free speculation, I recommend a small position to grow your portfolio's gold value. Buy the dips, but don't allocate more capital than you can comfortably afford to lose. This week, stocks were lower, bonds were higher, and currencies and commodities were mixed. Bitcoin made the largest gains, rising 8.1%, followed by the Japanese Yen, which gained 1.5%. The worst losses were in palladium, off 4.2%, and crude oil, down 3.2%. The Canadian Dollar was the only falling currency, giving up 1.2% for the week. The USD gained 0.4%, and short term bonds traded in line with cash, while the long term TLT rose 0.6%. Equities were all lower, led by the Dow Jones Industrials, which fell 2.6%. The S&P 500 fell the least, giving up 1.6%. Gold stocks dropped 1.7%. Cotton and coffee rose 1.4% apiece. Palladium fell 4.2%, and crude oil lost 3.2%. Silver was off 0.6%, the smallest drop of all the metals. It was a "risk on" week, with every asset class rising except Ethereum (down 6.8%) and gold stocks (HUI off 2.7%). The biggest gains were in cotton, up 9.4%, and crude oil, up 4.9%. Among the currencies, the USD added the most (rising 1.8%) while the Euro gained the least (moving up 0.6%). Short term bonds traded in line with cash, gaining 1.8%, while the long term TLT rose less, adding 1.3%. Equities were mostly higher, except for gold stocks, which ended down 2.7%, giving back most of their gains from the prior week. The S&P 500 gained the most, rising 2.3%. Cotton and crude oil were the strongest commodities, rising 9.4% and 4.9% respectively. Platinum and silver gained the least, adding 0.3% and 0.4% respectively. It was a major "risk off" week, with stocks, most commodities, and cryptocurrencies selling off, while JPY, USD and CNY cash and short term bonds moved higher. After weeks of heavy losses, Bitcoin and Ethereum seem to be stabilizing, as the selling shifts to stocks (especially gold stocks) and commodities (especially crude oil and palladium). The largest gains were in the Japanese Yen (up 2.9%) and coffee (up 2.5%), while the largest losses were in crude oil (down 8.4%) and palladium (off 6.2%). Gold stocks lost 6.0%, and the Nikkei fell 5.5%. 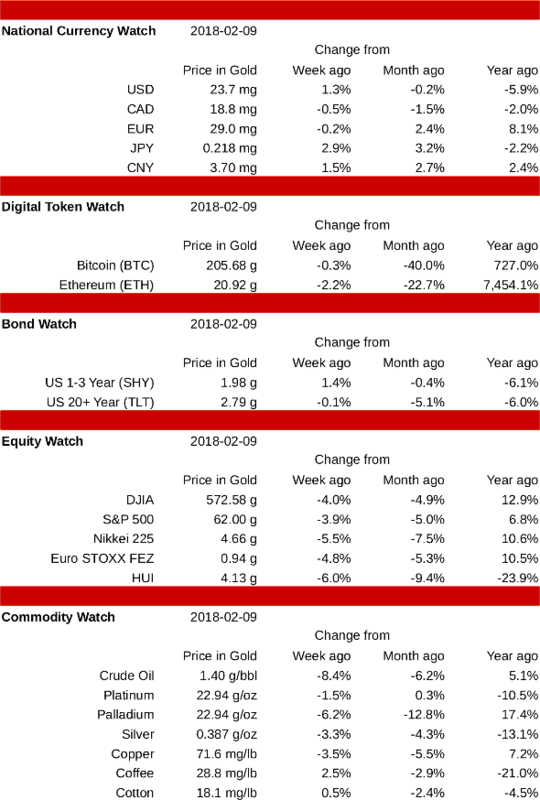 This week, commodities and currencies (national and crypto) were mixed, bonds were lower, and equities were mostly higher. Crude oil saw the largest price increase, rising 3.0%. Bitcoin fell the most, down 5.0%, but cotton was close behind, dropping 4.8%. Gold stocks made the second largest gains, rising 1.9%. The USD was the worst performing national currency, falling 1.3%, while the Japanese Yen rose the most, closing up 0.5%. Short term bonds fell more than USD cash, closing off 1.4%, and long term bonds fell a bit less, dropping 0.9%. Only the Japanese Nikkei closed lower this week, off 0.2%. Gold stocks gained the most, rising 1.9% to close at 4.7 grams. The S&P 500 gained 0.9%, while the European STOXX rose 0.4%. Crude oil continues its rise, adding 3.0% to close at 1.5 grams per barrel. Coffee also made good gains, rising 1.8% for the week. Cotton was the weakest of the commodities, closing down 4.8%. Palladium also fell hard, dropping 3.6% to close at 25.0 grams per ounce. Platinum fell 0.8%, while silver rose 0.7%. 2017 was an exciting year, especially in the cryptocurrency markets, where Bitcoin rose about 12x, Ethereum rose about 82x, and other smaller coins and tokens rose even more. Commodities were very active, with palladium surging 38% while coffee fell 19%. Bonds and most currencies were lower, while major stock indexes were higher. The only national currency to finish the year higher was the Euro, which rose 1.1%. The US Dollar fell the most, dropping 11.2%. Short term bonds fell even more than USD cash, dropping 11.6%, while long term bonds fell 4.0%. Although gold stocks fell 6.8% for the year, all the major stock indexes were higher, led by the Dow Jones Industrial Average, which gained 11.8%. The S&P 500 rose 6.8%. Metals were very active, with palladium and copper climbing 37.7% and 16.5% respectively, while platinum and silver fell 9.6% and 7.2%. Palladium crossed over platinum to become the more valuable of the two metals, while platinum itself made new all-time lows near the end of the year. Coffee had the largest losses of any asset class, dropping 18.6%. Crude oil finished the year little changed, up just 0.6%. Let's take a closer look at the Cryptocurrencies. The two coins tracked here, Ethereum and Bitcoin (the two largest by market cap) both had banner years. Ethereum started 2017 worth about 0.22 grams and finished the year at 18.2 grams, a gain of 8,172%. Bitcoin started the year at 26.3 grams (just under one ounce of gold) and finished at 333.9 grams (a bit over 10 ounces). Along the way, Bitcoin hit a high of 479.5 grams. Although this growth is astounding, keep in mind that during 2013, Bitcoin's value grew by 100x. These markets are actually maturing and become less volatile as they see wider adoption and more hedging. The crypto space overall evolved greatly during the year as well. Looking at the market capitalization of all coins and tokens, the space grew in value from about 0.5 kt (kilotonnes, or in SI terms, gigagrams) to a peak of 15.3 kt, before ending the year at 13.9 kt. For comparison, this is about 7.5% of the above ground supply of gold, estimated to be 187 kt – which curiously, is also roughly the estimated value of cash (bills and coins) in worldwide circulation. In addition to the market's growth in size, it has also evolved in composition. As the year began, Bitcoin represented about 87% of the market cap, while Ethereum was 4%, and all other cryptos combined were 9%. By the end of the year, Bitcoin was 38%, Ethereum was 12%, and all other cryptos were about 50% of the market. It will be interesting to see what 2018 brings! As electric cars take more of the transportation market, demand for platinum and palladium may decline, but copper and silver could strengthen. The cryptocurrency markets will continue to evolve, with many coins and tokens becoming worthless, while the market discovers the true price for those with real utility. I expect that Bitcoin and Ethereum will continue to be among the survivors, but I doubt they will see the kind of growth they enjoyed in 2017. If the trend towards higher interest rates continues, bonds will continue to decline, and as total debt rises, national currencies may also see further declines. All of these trends put the stock market into a precarious position; currently priced for perfection, what happens as portfolio allocations to gold, commodities, cryptocurrencies and cash rise? Forced to compete with rising bond yields, but paying higher rates for new financing, can equities maintain their lofty P/Es? Whatever comes, I wish you the very best in 2018! Digital tokens rose strongly, while other asset classes were mixed. Ethereum made the largest gains, rising a whopping 49.6% to close at 17.0 grams, while Bitcoin ended in second place, up 9.3%. Copper was in third place, rising 4.9%. The largest losses were in coffee, which fell 1.8% for the week, while the EURO STOXX 50 dropped 1.5% and platinum fell 1.4% to close at 21.9 grams per ounce, a new all-time low. The strongest currency was the Japanese Yen, which gained 0.5%. The Chinese Yuan fell furthest, dropping 0.6%. Short term bonds tracked US Dollar cash closely, each dropping 0.3%, while long term bonds rose 1.0%. After closing the prior week at a new all-time high of 399.3 grams, Bitcoin continued to work its way higher through the week, closing on Friday at 436.4 grams, up 9.3%, and setting another record. Bitcoin continued to rise over the weekend, closing on Saturday at 479.5 grams, but since has pulled back more than 15%. Ethereum climbed strongly early in the week hitting a new high of 17.6 grams on Wednesday, then settled back on Thursday and Friday to finish the week at 17.0 grams, up a stunning 49.6%. ETH has continued to climb since then, reaching a new all-time high of 20.4 grams on Tuesday the 19th. Gold stocks turned around this week, rising 1.3%, outperforming all the major stock indexes, the best of which was the Dow Jones Industrials, which gained 1.0%. The worst performer was the Euro STOXX, which lost 1.5%. Copper was the strongest commodity this week, rising 4.9%. Cotton was also strong, gaining 2.7%. Coffee was weakest, dropping 1.8%, while platinum fell 1.4% to a new all-time low of 21.9 grams per ounce. Platinum has since recovered smartly, and was trading at 22.6 grams as of Wednesday the 20th. Digital tokens and commodities were again mixed, while other asset classes were mostly higher. Bitcoin made the largest gains, rising 50.8% for the week to close at 399.3 grams. Cotton ended in second place, up 2.6%. The largest losses were in coffee, which fell 3.5% for the week, while gold stocks dropped 2.8% and platinum fell 2.6% to close at 22.2 grams per ounce, a new all-time low. The strongest currency was the US Dollar, which gained 2.0% to close at 24.9 mg, but the Chinese Yuan wasn't far behind, rising 1.9%. The Canadian Dollar and the Euro were the weakest currencies, gaining 1.0% apiece. Bonds tracked the Dollar closely, with long term bonds rising 2.1%, and short term bonds gaining 2.0%. After closing the prior week at a new all-time high of 264.8 grams, Bitcoin traded in a fairly narrow range until Wednesday and Thursday, when it soared to a new high of 417.8 grams before pulling back on Friday to finish the week at 399.3 grams, up 50.8%. Bitcoin continued to slide over the weekend, losing about 11%, but rallied on Monday the 11th to 416.5 grams, just 0.3% below Friday's all-time high. Ethereum dithered early in the week, then dropped 7% on Wednesday, but recouped most of that loss on Thursday and Friday to finish the week down 0.3% at 11.3 grams. ETH swung wildly over the weekend, but climbed on Monday the 11th to close at a new all-time high of 12.8 grams. Gold stocks were hit hard, falling 2.8% for the week, but all the major stock indexes were higher, led by the Dow Industrials which added 2.4%. The Japanese Nikkei rose least, gaining 1.3%. Cotton was the strongest commodity again this week, rising 2.6%. Palladium was also strong, gaining 1.3%. Coffee was weakest, dropping 3.5%, and platinum fell 2.6% to a new all-time low of 22.2 grams per ounce. Silver and copper were also weak, falling 1.7% apiece. As in the prior week, crude oil rose slightly, adding another 0.2%. 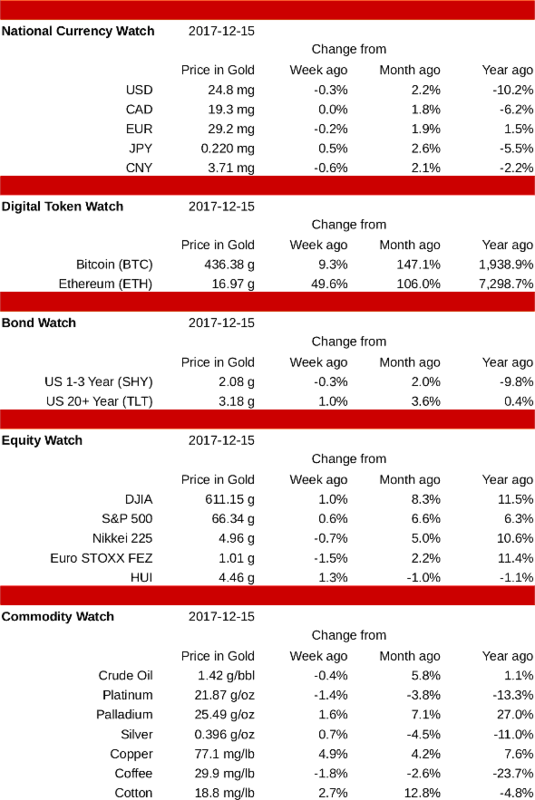 Digital tokens and commodities were mixed, while other asset classes were unchanged or higher. Bitcoin made the largest gains, rising 34.0% to close at 264.8 grams, a new all time high. The largest losses were in silver, which fell 2.6% for the week, closing at 0.4 grams per ounce. The Japanese Yen was the weakest currency, unchanged for the week. The strongest currency was the US Dollar, which gained 1.2% to close at 24.4 mg. Long term and short term bonds rose 1.0% each. Both were outpaced by notes of zero maturity (USD cash). Bitcoin worked it's way higher all week, starting at just under 200 grams, and closing at a new all-time high of 264.8 grams on Friday, a gain of 34.0%. The rising momentum has continued, setting more record highs and leaving Bitcoin at 283.7 grams as of Monday the 4th. Ethereum made a new all-time high on Monday the 27th at 11.5 grams, but by Wednesday had fallen 10.2%, to 10.4 grams. ETH recovered on Thursday and Friday, finishing the week at 11.4 grams, down 0.6%. Gold stocks were little changed, down 0.1% for the week, and European STOXX were unchanged. The Dow Industrials gained the most, adding 4.1%. The S&P 500 rose 2.7%. Cotton was the strongest commodity, rising 3.1%. Coffee and palladium were also strong, gaining 2.8% and 2.7% respectively. Silver was off 2.6%, while copper fell 2.0%, but platinum rose 1.1%. Crude oil rose slightly, finishing up 0.2% for the week. 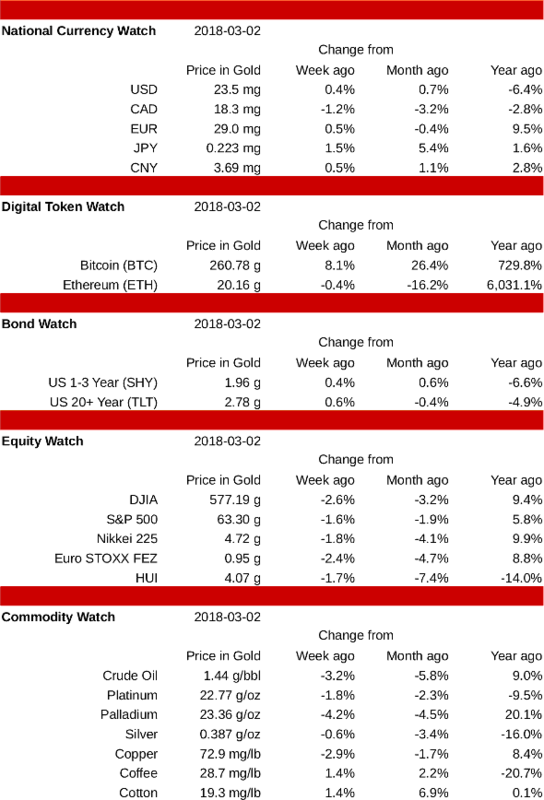 All asset classes except cryptocurrencies had mixed results this week. Bitcoin made the largest gains, rising 17.0% to close at 186.2 grams, after hitting a new all time high of 190.6 grams on Thursday. Ethereum also had a great week, rising 10.8%. The largest losses were in coffee, which fell 2.9% for the week. The Canadian Dollar was the weakest currency, falling 1.1% to 18.9 mg. The strongest currency was the Euro, which gained 1.0% to close at 28.5 mg. Long term bonds rose 1.8% while short term bonds dropped 0.1%. Notes of zero maturity (USD cash) were unchanged for the week at 24.2 mg.
Bitcoin started the week by declining over the weekend, hitting a low of 141.8 grams on Sunday, then began a strong rally that carried it to a new all-time high of 190.6 grams on Thursday before settling at 186.2 grams on Friday, up 17.0%. The rising momentum has continued, setting new record highs and leaving Bitcoin at 199.2 grams as of Monday the 20th. Ethereum worked it's way higher over the course of the week, ending up 10.8% at 8.0 grams. Gold stocks were 0.4% higher for the week, but all the major indexes were lower. The Dow Industrials and the Japanese Nikkei fell the most, dropping 0.3% each. The S&P 500 and the Euro STOXX each fell 0.1%. Coffee reversed course this week, falling 2.9% and giving up all of the prior week's gains. Cotton was the strongest commodity, rising 1.1%. Crude oil, palladium and copper each fell 0.3%, while silver gained 0.5% and platinum was unchanged.